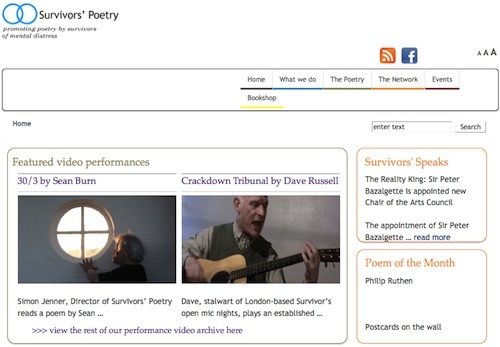 Last night was the 21st Anniversary of Survivors’ Poetry. It’s not difficult to fill the Poetry Café in Betterton Street, London, but it was a suitable venue for what was for me, an emotional occasion. Being involved with Survivors’ Poetry through the 1990s was instrumental in my getting involved with the Disability Arts Movement. Joe Bidder was then and remains to this day, an engaging mentor and advocate. Without him I would never have been able to move forward with the work I’ve done within the Disability Arts Movement over the last twenty years. At the event he reminded us how instrumental Arts Council were, then, through the vision of Bushey Kelly, in establishing Survivors’ Poetry. Joe reminded us how radical and effective the group was in establishing the first ever Arts Charity staffed and run exclusively by survivors of the mental health system. Another founding member Frank Bangay recalled how much of the organisation of gigs and workshops, back in the day, happened from his ‘office’ in the local telephone box! Frank’s poetry always stirs with a spirit for understanding and compassion, arresting the listener with images of the healing power of nature. Accompanied on guitar by Alastair Murray and with a mean harmonica in hand he gave us his song of hope for England. Frank has been a cornerstone of the Survivor Arts movement since the 1980s and continues to be a prolific writer and producer though his work with Core Arts. I’d recommend reading an interview with him by Xochitl Tuck published in the Spring/ Summer 2005 edition of Survivors’ Poetry Express. Another founding member Hilary Porter, talked about her initial reticence, followed by her gratitude for everything that Survivors’ Poetry has meant to her. I remember her dedication to making the events and workshops all those years ago so welcoming. Her self-effacing, warm nature were an inspiration that kept the Survivors’ spirit alive through many years. Razz has also been there since the beginning. He continues to bring an ineffable charm and enthusiasm to the performances and workshops he organises with Xochitl and takes part in at the Poetry Cafe and Tottenham ‘Chances’. The event made me realize how much I miss the spirit of survivors performing and the gentle supportive vibe that is such a hallmark of what is so valuable and necessary to giving survivors of the mental health system a space to express ourselves and to cope in a world that can be so cruel and insensitive towards those of us who struggle in our daily lives. Simon Jenner continues to keep Survivors’ Poetry going. The website contains some great live films of performances by various members of the group, including some of the wit and wisdom of the fourth founding member of the group, Peter Campbell, who unfortunately was unable to make the anniversary night. When Peter talks about the presence of God on Cricklewood station you just know he speaks truth. Go to http://www.survivorspoetry.org/the-poetry/performances/ for some real gems.